This name uses Spanish naming customs; the first or paternal family name is Moreno Valle and the second or maternal family name is Rosas. 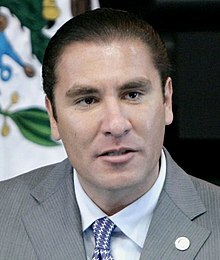 Rafael Moreno Valle Rosas (30 June 1968 – 24 December 2018) was a Mexican politician. He was a member of PAN. He was the Governor of Puebla from February 2011 through January 2017. Moreno Valle also was a Deputy of the LIX Legislature of the Mexican Congress representing Puebla and as a Senator. His wife was Martha Erika Alonso Hidalgo, the first woman Governor of Puebla from 17 December to 24 December 2018. On 24 December 2018, a helicopter carrying Moreno Valle and his wife Alonso Hidalgo crashed in a field near the town of Santa María Coronango, killing him aged 50. ↑ "Perfil del legislador". Legislative Information System. Retrieved 24 December 2018. ↑ "Se estrella avioneta en Puebla en pleno 24 de diciembre". El Sol de Puebla. 24 December 2018. Retrieved 24 December 2018. This page was last changed on 21 March 2019, at 21:52.